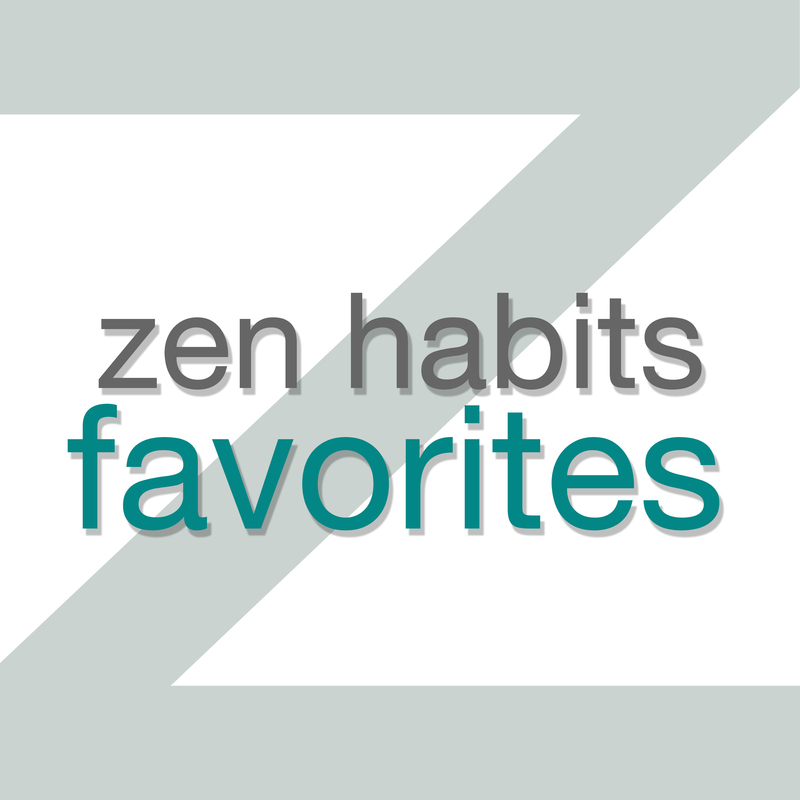 Zen Habits Audio – Page 5 – Home of the Zen Habits Favorites podcast. Would it seem miraculous if you could dissolve anxiety, fears, stress, frustration, anger … by making a small mental shift? The answer might lie in thinking about how we watch films. Last night, I was watching the Lord of the Rings trilogy with my kids, and my 9-year-old daughter said some of the things in the movie scared her. I started talking about how they’re all just actors, and isn’t it funny how they dress up in these costumes to tell us this story? By helping her to see through the make-believe of films, I was trying to help her dissolve some of the fears she had. Amazingly, I’ve found that this works for all our other fears and difficult feelings. We just need to stop believing in the make-believe in our heads. Think about this: when you watch a film, you suspend your disbelief. You know it’s all pretend, but for the 90 minutes or so you’re watching the film, you agree to forget that it’s make-believe. You believe. And this allows the film to move you, to cause you to cry, be angry, be scared, be overjoyed by the climax. Not everyone does this — some of us think, “God, the story-telling is awful, the actors aren’t very good, the special effects are cheesy, I can’t believe they’re making me watch this.” Those of us who don’t suspend our disbelief aren’t very moved. In the rest of our lives, we constantly believe in the stories in our heads. When we think about how someone has been inconsiderate, we believe in a story where we are the hero and the other person is the villain, and think of how they wronged us. When we are disappointed when someone else doesn’t love us the way we want them to, we believe we’re in a romantic comedy and the other person should fall in love with us and be the perfect partner. This happens over and over: all of our anger, stress, sadness, depression … it all comes from the stories we tell ourselves about what’s happening in the world around us. The things happening in the world around us don’t revolve around us, and aren’t part of a story. They’re just happening. Often it’s all random, but to deal with this chaos, we try to make sense of it as part of a story. We create meaning where none exists. We think the other person has bad intentions towards us when actually they are just thinking about their own stories. So what’s the answer? The answer is in how we watch films: if we stop believing in the story of a film, and start to see the film as a series of moving pictures that someone has created from props, sets, costumes, digital effects, scripts, sound studios and more … we see the reality and don’t feel the hurt, the anger, the fear. When we feel difficult emotions in real life, we can stop believing in the story, and start to see the reality of what’s happening: there’s just physical objects around us, moving. There are atoms and molecules, living organisms, people who can talk and create. Those are not part of a story, but just happening. By letting go of this false belief, this mis-belief in the made-up story, we can let go of the fears and anger and frustrations that come with it. So when you feel stressed, sad, mad … that’s totally fine. But just realize that you can stop believing in the story, if you choose. The Miracle of Suspending Mis-Belief was first published on Zen Habits on 6/12/15. This Moment is Enough was first published on Zen Habits on 5/13/16. Pretty much all of us experience frustration on a daily (or even hourly) basis. We get frustrated by other people, by ourselves, by technology, by work situations, by small crises that come up all the time. You know you’re frustrated when you find yourself sighing, or complaining about people, or fuming about something that happened, or going over why you’re right and they’re wrong. Frustration is normal, but holding on to frustration is not so fun. It’s not even helpful: if the situation isn’t great, adding frustration on top of it just makes it worse. Often frustration will make us not happy with someone else, and worsen our relationship with them. Or it will cause us to be less calm, and handle a situation less than ideally. How can we calm ourselves and let go of our frustrations, so we’re not so irritated and angry throughout the day? Let’s talk about why we get frustrated, and how to address this problem. Where does our frustration come from? It’s from not wanting things to be a certain way. Not wanting other people to behave a certain way. Not wanting ourselves to be a certain way. It’s a rejection of how things are. From this, we start to tell ourselves a story: she shouldn’t act that way, she should do this. And she always does this! Why can’t she just see that she’s wrong? She’s so irritating! We tell ourselves stories all day long, and we get caught up in them, and this is where we dwell in our frustration. You can’t help frustration coming up, no matter how Zen you’d like to be. It’s natural, and so are the stories we tell ourselves. However, you can develop an awareness of it. Are you mad or irritated with someone right now? Do you find yourself clenching your jaw because of a situation? Sighing? Complaining to someone, wanting to vent? Are you fuming? Arguing your case in your mind? When you notice yourself experiencing frustration, pause. Just sit still for a moment, even just a few seconds, and notice your frustration. Notice how it feels in your body. Then start to notice the story you’re telling yourself. What are you telling yourself is wrong with the situation? What are you saying the other person should or shouldn’t do? How are you characterizing the other person or situation? Now ask this: is this story helping me? Is it making the situation better or worse? Is it helping your relationship with the other person? Is it making you happy? If it’s not helpful, maybe you’re creating your own unhappiness, entirely in your mind. Instead, perhaps you can see this frustrating situation as a lesson in mindfulness, in letting go, in acceptance, in finding happiness no matter how other people act, no matter what situation you’re in. Every moment has a lesson, if we’re willing to look. If we open up ourselves to this situation, we can learn a lot about how to see other people not as we want them to be, but in the glorious messy beauty of how they actually are, without needing them to change. If you’re learning from this situation, you can also see that the other person is suffering. Not in the sense of “life is simply miserable and I’m suffering in agony,” but in the sense of “something is making me unhappy.” Something is causing the other person to act “imperfectly,” because they’re conflicted about something, they’re frustrated themselves (as you are). In this way, you are both experiencing the same thing. You are connected, and you can understand how they feel because you’re feeling it too. They are behaving imperfectly, yes, but we all do that. That doesn’t make it right, but perhaps you can empathize with them, maybe even try to understand their story, where they’re coming from. Try to see how the way they’re behaving makes sense to them from their perspective. It does, you just can’t see it. Now perhaps you can let go of your way. You want things to go your way, want people to behave the way you want them to. But you don’t and can’t control the universe. You aren’t entitled to getting everything your way. Other people get to act imperfectly, behave their own way, and it’s true that you don’t have to agree with them or love the way they’re acting, but insisting in your own mind that things go your way or people act the way you want them to won’t work, and will only make you frustrated. So let go! So “c’est la vie” and loosen your grip on the way you want things to be. Finally, say “yes” to this experience. It’s perhaps not ideal, but what is? Say “yes” and embrace the way this moment is. Practice this saying “yes” on a regular basis, and you’ll loosen up on your clinging to things, you’ll start to appreciate what is beautiful about the present moment, and start to be frustrated less often. A Mini-Guide to Not Being Frustrated All the Time was first published on Zen Habits on 4/19/16.